Researchers discovered in the 18th century that plants absorb essential mineral nutrients as inorganic ions in water. In natural conditions, soil acts as a mineral nutrient reservoir but the soil itself is not essential to plant growth. When the mineral nutrients in the soil dissolve in water, plant roots are able to absorb them. When the required mineral nutrients are introduced into a plant’s water supply artificially, soil is no longer required for the plant to thrive. 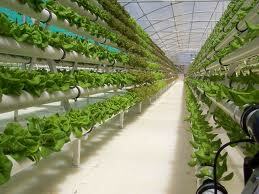 Almost any terrestrial plant will grow with hydroponics.